Home >> Generated from JAN's SOAR Information System on 4/21/2019 12:10:33 AM. 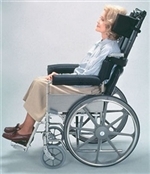 Backrests are an alternative to expensive adjustable-back wheelchairs! Add or remove foam pads to customize. Recline position to 30° from vertical (not adjustable).